M@ Is This London's First Sci-Fi And Fantasy Story? While browsing through an antique book of oddities (The Romance of London by John Timbs, 1869), we came across the following tale. It concerns a sinister old man who lives in the golden ball atop St Paul's Cathedral, from where he spies on the populace with a suite of surveillance devices. This creepy story is supposedly an account of a man suffering hallucinations, but it reads like a sci-fi/fantasy story. Could it be the first example of that genre to be set in London? Read to the end for some surprising connections to Charles Dickens. One afternoon, in the month of May, feeling unsettled, and not inclined to business, he took a walk into the City, and having strolled into St Paul's Churchyard, he stopped at the shop window of Bowles and Carver, and looked at the prints, one of which was a view of the Cathedral. He had not been there long before a short grave-looking elderly gentleman, dressed in dark brown clothes, came up and began to examine the prints, and soon entered into conversation with him, praising the print of St Paul's in the shop window, relating some anecdotes of Sir Christopher Wren, the architect, and asking if he had ever been "up St Paul's." He replied in the negative. The stranger then proposed they should dine together, and then ascend the Cathedral: this was agreed to, and having dined at a tavern in a court in the neighbourhood, they very soon left the table, and ascended to the ball just below the cross which they entered alone. They had not been there many minutes, when, while he was gazing on the extensive prospect, and delighted with the splendid view below him, the grave old gentleman pulled out from an inside coat pocket something like a compass, having round the edges some curious figures; then having muttered some unintelligible words, he placed it in the centre of the ball. He felt a great trembling and a sort of horror come over him, which was increased by his companion asking him if he should like to see any friend at a distance, and to know what he was at that moment doing, for if so, the latter could show him any such person! Now his father had been for a long time in bad health, and for some weeks past he had not visited him. A sudden thought came into his mind that he should like to see his father. He had no sooner expressed his wish than the exact person of his father was immediately presented to his sight on the mirror, reclining in his armchair, and taking his afternoon sleep. He became overwhelmed with terror at the clearness of the vision, and entreated his mysterious companion to descend, as he felt very ill. The request was complied with, and in parting under the northern portico, the stranger said to him, " Remember, you are the slave of the man of the mirror." He returned in the evening to his house; he felt unquiet, depressed, gloomy, apprehensive, and haunted with thoughts of the stranger; for the last three months he had been conscious of the power of the latter over him. Dr Arnould inquired of him in what way this power was exercised. He cast on the doctor a look of suspicion, mingled with confidence, took his arm, and after leading him through two or three rooms, and then into the garden, exclaimed, "It's of no use— there is no concealment from him, for all places are alike open to him— he sees and hears us now." I asked him what these hieroglyphics were, and how he perceived them. He replied, 'Signs and symbols which you, in your ignorance of their true meaning, have taken for letters and words, and reading as you have thought. Dr de Boismont, who, in his clever work On Hallucinations, gives the above, considers that there cannot be an instance of an hallucination more completely followed out in detail, or better adapted to produce a conviction in the minds of persons not acquainted with these singular phenomena, than the one which is here related by Prichard. In the Middle Ages this person would have been considered as possessed, and would doubtless have been subjected to the ceremonies of exorcism. Even in the present day, a similar tale would find many believers. 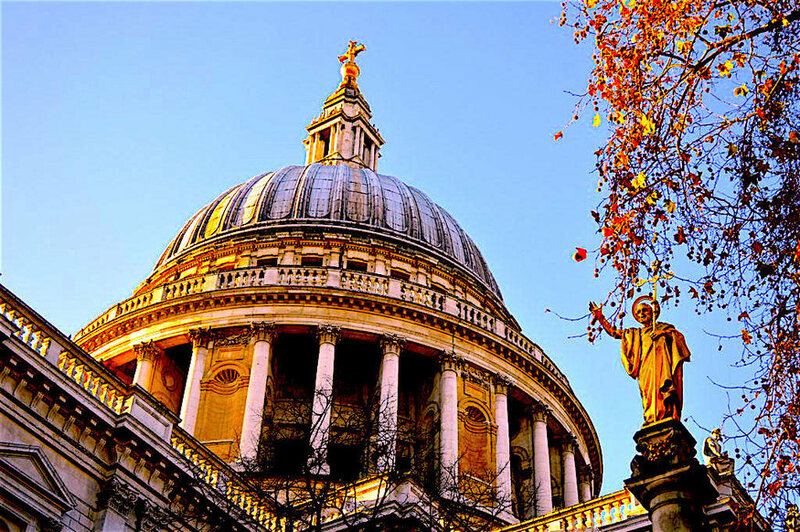 It is highly probable that this person had formerly visited St Paul's, but, having become insane, his recollections of previous occurrences were mixed up in a very extravagant manner. As they grew more and more vivid, they became depicted by the imagination in a manner which caused the eye to mistake them for realities. *A Treatise on Insanity, and other Disorders affecting the Mind, by James Cowles Pritchard, p.455. London 1835. This story was reprinted in The Romance of London, 1865, but was taken from an earlier publication of 1835, mentioned in the footnote. The date is intriguing. Charles Dickens published Oliver Twist in 1838, just a few years later. It contains a line that appears to have been inspired by this tale: 'it was as much as he could do to make out the forms of the different objects beyond, without making any attempt to be seen or heard,—which he had as much chance of being, as if he had lived inside the ball of St. Paul's Cathedral.' Both the hallucinating man and Dickens may have been inspired memories of the observatory that briefly topped St Paul's in 1820. Dickens fans will have spotted another coincidence in the story. Of all the pieces of sign writing to be found in London, the mischievous ball-dweller alights on the words 'Warren's Blacking factory'. As a boy, Dickens had spent many a miserable hour toiling away in this Charing Cross warehouse. Had Dickens seen the treatise on hallucinations, and woven the idea of the orb dweller into his own story? We'll leave that one to Dickens scholars, but it's an intriguing thought. With thanks to Lee Jackson @VictorianLondon for discussion on this matter.